The DR. 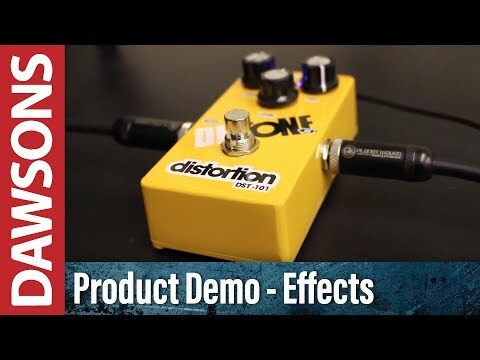 Tone DST101 Distortion pedal is great for injecting a bit of venom into your signal path. Whether you're looking to add a gentle bit of gristle to your guitar's tone, or want something akin to thunderstorm, this versatile little beauty can do it all. When you're thrashing around onstage, it is of the utmost importance that you can rely on your equipment to stand up to a bit of abuse. The DR. Tone DST101 is built to take a beating, with a solid chassis that holds up to the most vigorous of tests. The pedal can be powered by mains power using a 9V adapter, or a 9V battery when mains power isn’t available. The simple layout consists of single input and output jacks, along with a footswitch, and three control pots: DIST, TONE and LEVEL. The 'DIST' control sets the amount of distortion effect, giving you huge range from subtle overdrive to crushing metal tones. The 'TONE' control lets you adjust the high frequencies to cut through the mix and get the desired sound, giving you the choice of crafting rumbling desert rock grooves to searing Van Halen leads. The 'LEVEL' control lets you set the loudness of the effect, so when you hit the footswitch and add the distortion, you get the desired boost. The Dr Tone DST101 distortion pedal isn't just for guitarists either, the pedal is also compatible with bass guitars, so you can get that desired fuzz on your bass too! Whether you're just setting off on your musical journey, or are a seasoned pro who takes to the stage on a regular basis, the DR. Tone DST101 is a magnificent pedal that gives your tone the lift it needs to take you above and beyond the overall mix, guaranteeing that you’ll be the centre of attention. Posted on 31/12/2012 by Tom Amazing pedal, this pedal easily keeps up with the like of the Boss ds-1/ ds-2, it really is a brilliant pedal and way worth the £30 I paid for it, I use this pedal with my line 6 spider 4 amp and it sounds great, a much clearer distortion that what is built in to the amp, honestly these pedals aren't just for beginner guitarists, these will impress all players, no matter what skill level. Posted on 11/04/2012 by zeen6000 It’s a great pedal that is very durable and as the first ever pedal I bought it has worked well and had no problems. It’s priced right for a beginner guitarist.